[Galaxy J series 2017] Which settings option are supported on front camera? To access the Settings, on the preview screen, tap Settings icon. The available options may vary depending on the shooting mode and which camera is being used. • Picture size: Select a resolution for photos. Using a higher resolution will result in higher quality photos, but they will take up more memory. • Video size: Select a resolution for videos. Using a higher resolution will result in higher quality videos, but they will take up more memory. 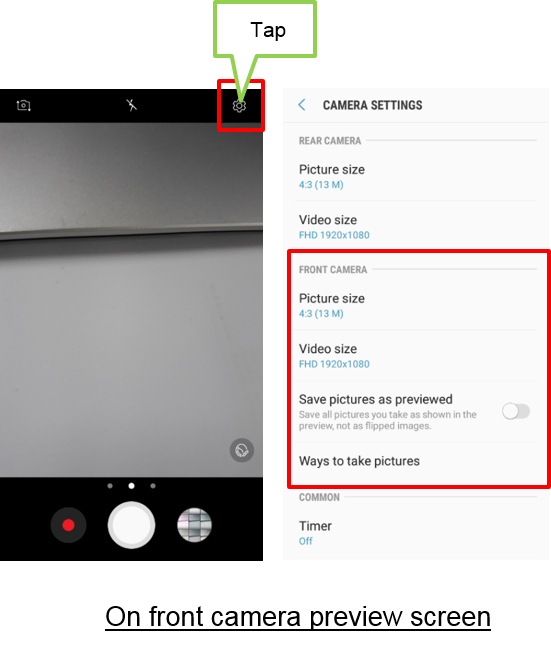 • Save pictures as previewed: Invert the image to create a mirror-image of the original scene, when taking photos with the front camera. • Ways to take pictures: Select shooting options to use.